FINDING WORK IN THE CONSTRUCTION SPACE. The construction market’s current climate often makes bidding on jobs incredibly frustrating. Construction activity has slowed to a crawl over the last few years; however, that does not mean the situation is hopeless. There continues to be electrical construction jobs to bid on, but finding them takes a little extra creativity and know-how. The following list breaks down the job finding and bidding process. Our first tip is about the very beginning of the bidding process: finding leads. The hardest part of any job is often figuring out where to start. Electrical contractors can find new construction leads through a variety of sources. In the past, printed public announcements were often where you’d find most jobs. However, in current times this has given way to online posts on industry-related websites. A quick Google search for “construction bid leads services” should introduce you to a variety of helpful services. If you’re not familiar with a particular service ask for a “trial” before you buy. In addition, ask for references of other clients you can call to see if the service is, in their experienced opinion, worth the cost. Although this may be obvious, make sure the construction bid lead service actually lists jobs that pertain to electrical divisions 16 or 26. Also, federal, state, and local authorities are required by law to post their jobs for an extended period of time in local newspapers and/or in industry publications. General contractors (GCs) also post jobs on their own websites. Construction bid boards promote national, regional, and/or state jobs. Subscription prices are based on the “draw” area of the board, meaning that the more comprehensive the board, the more expensive the subscription. Therefore, if you mainly work in the state of Connecticut, for instance, you’ll want to subscribe to a service that includes only Connecticut job leads. On the other hand, if you work in multiple states, you’ll want to seek out job lead bid boards that have a more extensive coverage area. Construction bid lead services charge you a subscription fee, which is typically based on an annual rate. Some companies require payment for the entire year at the beginning of your subscription, while others may charge you a monthly fee. Inquire about a “trial subscription” if you are unsure about the benefits of a particular lead service. It is important to place enough bids that you are actively searching for multiple jobs; however, it is also important to remember that as your search widens (as you’re placing more bids), after a certain point each bid’s quality will decrease. It often makes more sense to follow up after you submit your bid than to constantly submit new bids. If you don’t follow up on your bids, a company is more likely to toss you into a slush pile of hopefuls that they won’t ever look at again. Until the project is awarded, you will continue to have an opportunity to sell your company and its strengths. Once you’ve landed a job, the next challenge is planning out the execution. One of the most frustrating and often the most expensive part of this process is renting equipment. If this is something you find yourself frustrated with job after job, there is an exciting new way to go about rentals that may interest you. Tobly, Inc.is an easy-to-use construction rental company that prides itself on being transparent about cost and making renting equipment as easy and efficient as possible. In addition to making the execution of your job easier, signing up for the Tobly newsletter is an excellent way to get information on bids near the area they cover. 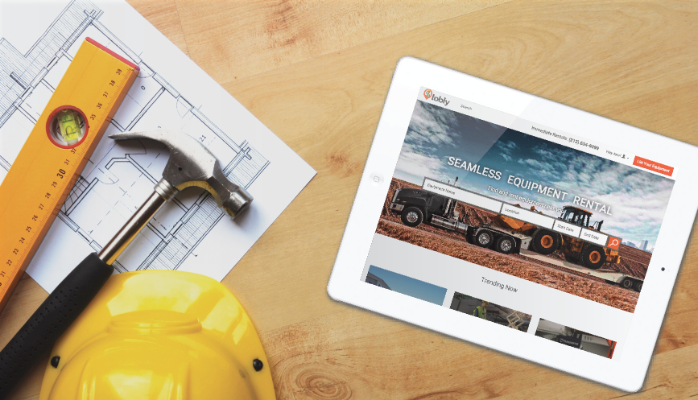 Tobly’s website is intuitive and user-friendly, complete with features such as a search bar where you can directly enter the equipment you need, location you need it for, and the start and end date of your job. The website also includes a “Trending Now” section where popular equipment is listed along with its location and price displayed. The following is a list of a few of the more popular web-based job lead boards in the construction industry. The Blue Book‘s BB-Bid provides users with invitations to bid on private projects from general contractors, property managers, facility managers and real estate developers on a nationwide or regional basis. Dodge Construction, find projects by state or type, order plans online, or read Dodge reports in print or via the Internet. Customers can customize services based on their specific needs and Dodge offers national coverage. “Connections” is Reed’s Construction Data complete source for construction project news, lead management, and related resources. Coverage spans the United States and Canada. CDC News focuses on the commercial construction industry. Its verified bid information includes verified cost estimates, quantitative project descriptions, and more about commercial construction projects up and down the East Coast and the entire state of Texas. Private, public, and single family projects can be found on Bid Clerk. Developers, construction managers, and more can post their projects on BidClerk to solicit bids for their projects. Nationwide coverage plus Puerto Rico is available. Jobs2bid offers a bid management system, regional lead services, and a plan room. General contractors can digitally post jobs and plan sets, while electrical contractors can search hundreds of leads every month in the states of Connecticut, Massachusetts, Rhode Island, New York, Maine, New Hampshire, Vermont, and Florida. ConstructionWire and Bid Notices provide more than 8,000 commercial construction reports and bidding opportunities every month across all 50 states. I do consider all the ideas you’ve offered on your post. They’re very convincing and will definitely work. Still, the posts are too quick for newbies. Could you please extend them a little from subsequent time? Thanks for the post. Next Post: TOBLY, NEW YORK’S PREMIERE EQUIPMENT RENTAL MARKETPLACE OFFICIALLY LAUNCHES NEW FEATURE TO PROMOTE TRANSPARENCY AND TRUST!